On March 17, Kashmir-based former IAS officer Shah Faesal, whose two heroes, according to him, are Pakistan PM “Imran Khan” (butcher of Pulwama) and anarchist Delhi CM “Arvind Kejriwal”, founded his own outfit. It was named as Jammu and Kashmir People’s movement (JKPM). It was launched from Srinagar’s Rajbagh, also known as the capital of Kashmiri separatists. Present on the occasion, among others, was a member of “Bharat Tere Tukde Honge” gang member, Shehla Rashid. The formation of the JKPM didn’t go well with the intolerant, uncouth and brazenly communal Omar Abdullah, the National Conference (NC) Vice-President and former J&K Chief Minister. He reacted the same day, of course, without naming it. He was both rude and crude. He dismissed it as a New Delhi’s brain-child and as a conspiracy hatched against Kashmir and Kashmiri Muslims calculated to suppress the voice of Kashmiris (read Muslims, especially Sunnis) and sabotaging the NC’s autonomy movement. Denouncing the formation of the JKPM, Omar Abdullah said: “Contesting elections or floating your own political party is part of democracy and I don’t have any issues with that. But why is it that these political parties are launched only in Kashmir; why not from Jammu or Ladakh? Doesn’t it clearly indicate a ploy aimed at dividing us further? “It is a fact that conspiracies have been hatched for long to weaken our special status. While in Jammu and Ladakh, the (political) field is being left open for the Congress and the BJP, here (in Kashmir) there is always an attempt to divide the mandate…Ever since his party brought the autonomy resolution in the J&K assembly in 2000, attempts are on to ‘suppress’ the voice of the people. The creation of the PDP served the same purpose,” he further said. 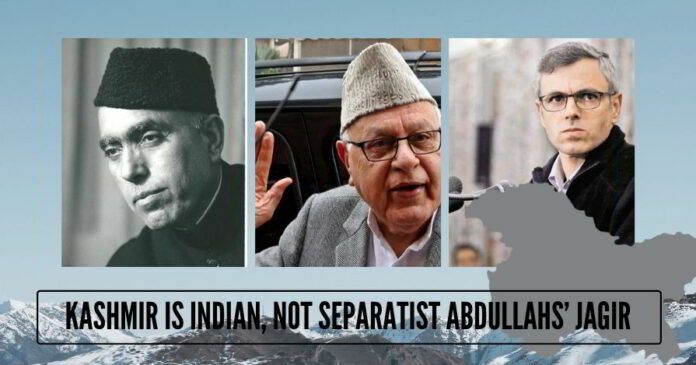 He also used the occasion (Convention of NC workers at Kashmir’s Anantnag town) to invoke his grandfather Sheikh Abdullah to further make his point that New Delhi had consistently conspired against Kashmir (read NC) and Kashmir’s special status. What did Omar Abdullah say? He, inter-alia, said: “His grandfather, late Sheikh Muhammad Abdullah, had foreseen this (formation of more and more outfits) long back. Just before his death, he had predicted that New Delhi will create leaders in every nook and corner of Kashmir. Today, we are witnessing the same, with people from every nook and corner – from Kashmir’s Shangus to Achabal to Anantnag to Pahalgam – all claiming to be leaders”. It is in this context that he has been expressing himself against the PDP and the newly-founded JKPM. Kashmir returns to the assembly 46 members, Jammu 37 and Ladakh a paltry 4. In 2002, the PDP contested the assembly elections and won 16 seats in the 87-member House, all from Kashmir and all Muslims, mostly Sunni. The PDP winning 16 seats broke the age-old monopoly of the NC in Kashmir. The NC under the leadership of Omar Abdullah won 28 seats, 29 less than its tally of 57 in 1996. It was for the first time that Kashmir gave a fractured mandate. The PDP won 17 seats and also dislodged the Farooq Abdullah Government. Courtesy: AICC president Sonia Gandhi. She handed over the state power to Mufti Sayeed on a platter on November 2 in the name of what she called “national interest”. Sonia Gandhi handed over J&K to the Muftis despite the fact that the Congress had won 20 seats, 15 from Jammu and 5 from Kashmir. Other parties which supported the post-poll alliance between the Congress and the PDP included the 4-MLA Jammu-based National Panthers Party (NPP) and 3-MLA Kashmir-based People’s Democratic Front (PDF). The NC again contested the assembly elections in 2008 under the leadership of Omar Abdullah. Much to his chagrin, the NC could not improve its tally of 28. In other words, the NC again won 28 seats. Contrarily, the PDP improved its strength from 16 in 2002 to 21 in 2008. It won 18 seats in Kashmir and 3 in Jammu. All the 21 PDP MLAs were Muslims. The Congress won 17, as against its 2002 tally of 20. The BJP won 11, its highest-ever tally so far. This time, however, Sonia Gandhi didn’t oblige the Muftis. She preferred Omar Abdullah. In other words, the NC-Congress coalition government was formed with Omar Abdullah as the Chief Minister. Though the NC recaptured power after a gap of 6 years, Omar Abdullah was not happy as he had to reckon with the assertive Congress minister from Jammu. He wanted to rule the state as if he was a one-party government but Jammu-based ministers like Sham Lal Sharma would put their foot down again and again. Sham Lal Sharma even demanded trifurcation of J&K, saying the people of Jammu and Ladakh were fed up with the discriminatory policies of the successive Kashmiri-dominated governments in the state. It was in 2014 that the NC suffered the worst-ever defeat. It could win only 15 seats. The PDP won 28 (25 from Kashmir and 3 from Jammu – all Muslims), the BJP 25 from Jammu (24 Hindus and one Muslim) and the Congress 11 (4 each from Jammu and Kashmir Valley and 3 from Ladakh (all non-Hindu). The PDP and the BJP, which had fought against each other, stitched post-poll alliance. Mufti Sayeed formed the coalition government on March 1, 2015. The PDP-BJP coalition of “North and South Poles” collapsed on June 19, 2018, when the BJP withdrew its support to Mehbooba Mufti, saying it was pro-separatist and that she always accorded a preferential and differential treatment to Kashmir and made unjust, invidious and humiliating distinctions between Kashmir and the state’s 2 other regions at all levels and in all spheres. Omar Abdullah has on occasions more than one asserted that the fractured mandates and the formation of new outfits in Kashmir have only eroded the state’s special status and that if the state’s special status was to be protected and further promoted, the people of Kashmir (Muslims) have no other alternative but to give the NC an absolute majority. It is in this context that he has been expressing himself against the PDP and the newly-founded JKPM. Kashmir returns to the assembly 46 members, Jammu 37 and Ladakh a paltry 4. Next articleHas Karti Chidambaram lost even before filing his papers? For nearly 70 years, under Nehru-Gandhi-Mountbatten midnight formula “Kashmir” is still being treated as Abdullah family’s Jagir while Sonia-Rahu-Priyanka Vadra treats “India” as their Jagir. Unaccountable Indian Judiciary protects them from various crimes and mega scams! Kashmiri pandits were pushed out of their homes as planned by secular skunks and are refugees in their land struggling and earning elsewhere in the country. Majority Hindus have been voting on caste and family lines to keep innumerable political families and cateists in power !! 2014 Mission 282 walas forgot “core issues” and running after “fiscal deficit targets”(as if it is sacrosanct), running for top 5 economic super power slot on Global scale!! Tax payers are helpless and overburdened with maintaining anti nationals daily expenses, perquisites and security covers! What kind of democratic process is going on in J&K without the involvement of Pundits? Why their voting rights are snatched? Their right to vote can’t be taken away under any circumstances. Let them vote from their Refugee camps or wherever they are staying, like NRIs vote.